In the context of a preemption issue the court decides that the FDA is not a learned intermediary. Plaintiff was injured by an implanted infusion pump. He sued the manufacturer for various torts. The trial court dismissed them all as being preempted by the Medical Device Amendments to the FDCA. The Court of Appeals upheld the dismissal of all but one; it reversed on failure to warn. The Supreme Court granted review of that issue. The court quotes the seemingly-broad preemption language of the MDA then notes that federal courts have wormed a “narrow gap” through it. If traditional tort law bars the same conduct that the MDA does then the state may enforce it. (That’s more our way of putting it than the court’s, which perforce employs the plodding and unfortunate constructions of federal preemption jurisprudence.) The state can’t bar different conduct — that’s expressly preempted. And it can’t make new law to bar the same conduct — that’s impliedly preempted by the MDA provision that only the federal government can enforce it. Failure to warn in the sense of failing to inform the patient or doctor is expressly preempted. So Plaintiff’s claim was that the defendant failed to inform the FDA of certain adverse event reports. The MDA requires this. 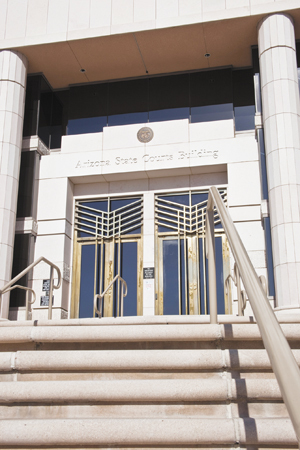 A Ninth Circuit case — Stengel (2013) — said that the FDA was a learned intermediary under traditional Arizona tort law. The Court of Appeals followed Stengel. The Supreme Court disagrees. No Arizona authority had held government agencies learned intermediaries. Under the Restatement 3d (Torts §6) intermediaries are “prescribing and other health care providers,” which the FDA isn’t. And Restatement 2d §388 required a “reasonable assurance” that the warning would reach patients or providers; the FDA isn’t required even to make adverse events reports public and when it does so merely uploads them to a database (helpfully named, should you ever want to use it, MAUDE). Because the FDA is not a learned intermediary the claim against it seeks to enforce the MDA and is therefore impliedly preempted. This of course has implications beyond preemption. The court also says a few other things that may turn up in other contexts. “Warning claims are negligence claims,” citing Watts and Dobbs; Watts “implicitly displaced further reliance on” Restatement 2d §388 in favor of Restatement 3d §6; adverse event reports are not warnings (which the court assumes them to be arguendo while strongly and repeatedly implying the opposite, noting their unreliability). The trial court is affirmed; relevant portions of the Court of Appeals opinion are vacated.